All-Star catcher Kang Min-ho signed a multi-year free agent contract with a new club Tuesday, making a big splash in what has been a relatively quiet market this offseason. 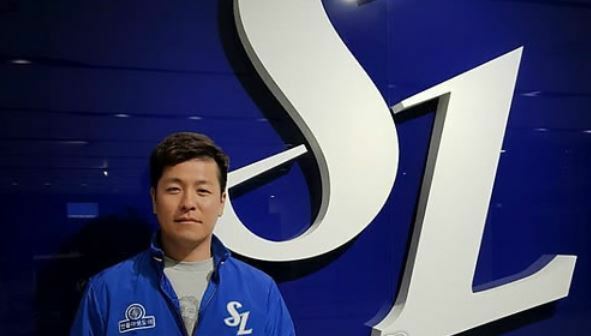 The Samsung Lions of the Korea Baseball Organization announced a four-year, 8 billion-won ($7.3 million) deal with the 32-year-old backstop. The Lions said the deal includes a signing bonus of 4 billion won. Kang, 32, has spent his entire 14-year career with the Lotte Giants. When he first became a free agent in November 2013, Kang re-signed with the Giants for 7.5 billion won over four years. This time, the hard-hitting catcher decided to test the open market and cashed in with the four-year deal. "It was really a difficult decision to leave a team where I've spent more than a decade, but I could feel that Samsung really wanted my services," Kang said in a statement released by the Lions. "I'd like to thank Lotte fans for all their support, and I'll never forget them. And I'll always do the best I can to win the hearts of Samsung fans." Kang joins a club that has fallen on hard times after winning four consecutive championships from 2011 to 2014. The Lions finished the runner-up in 2015 and then finished in ninth place among 10 clubs in both 2016 and 2017. The Lions have been trying to rebuild for the future, but they've gone with a 30-something veteran at a position where they felt they could use some stability. "We've been trying to give young players a chance to play as part of our rebuilding," the Lions said. "But we also felt we needed an established veteran who could offer some steady influence. With Kang, we're getting a player who has the experience and skill set." Kang has been one of the KBO's best offensive catchers over the past decade. In 2017, he batted .285 with 22 home runs, 22 doubles and 68 RBIs to lead all catchers in those categories. It was his third straight 20-homer season. Kang has reached double figures in long balls in each of the past eight years.